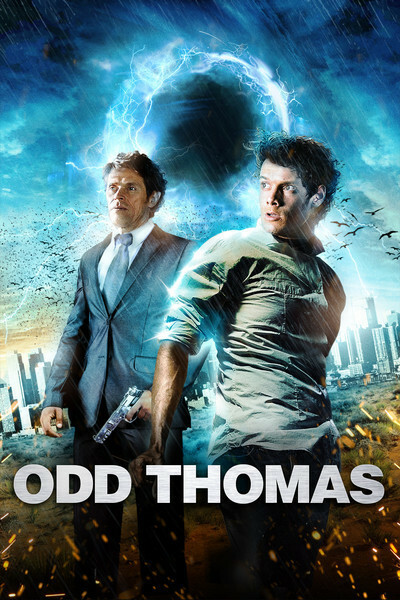 After reading Dean Koontz's "Odd Thomas" on a Vegas vacation, I thought to myself that it would someday make a fun film, perhaps even a franchise (as it has been in book form). Stephen Sommers has proven me wrong. "I may see dead people but then, by God, I do something about it," says Odd Thomas (Anton Yelchin), a seemingly ordinary fry cook in Pico Mundo, California. Odd is no passive communicator with the other side; he sees ghosts but then he helps them find justice, such as in the opening scene in which he confronts the killer of a young girl who comes to Odd for help. What follows is a scene that immediately sets up "Odd Thomas" for failure. Odd chases the killer through neighborhoods to a pool party and Sommers' need for action tricks learned on the sets of "The Mummy" and "Van Helsing" smothers the scene in headache-inducing nonsense. Quick zooms, slow-motion fighting, loud electronic music, freeze frames—it's a lesson in overused tricks and immediately one senses that a flawed project is being covered in elements designed to hide its many narrative and character mistakes. It has the clunky, haphazard look of a straight-to-video "Scream" rip-off. Odd has a girlfriend named Stormy Llewellyn (Addison Timlin)—yes, seriously—but Sommers' adaptation of Koontz's book is SO reliant on the twisting, supernatural narrative that we learn nothing and care not a bit about the Odd-Stormy dynamic that was such a bedrock of the source. Odd and Stormy are destined to be together forever—surely a tough task for a casting agent but one that's completely bobbled here as Yelchin and Timlin have zero chemistry. Timlin has an interesting screen presence and stole the otherwise-mediocre "Best Man Down" last year but she's wooden and ineffective here. Fans of the book will know that an "Odd Thomas" without an interesting Stormy is fighting an uphill battle. Willem Dafoe looks bored as the cop who knows Odd's secret and Patton Oswalt appears in a cameo to remind fans of the book that there was an interesting character in it that's been essentially turned into a plot device. Early on, Odd has a vision of faceless people in bowling shirts being gunned down while they scream for his help. Imagine having to stage a vision like that. It works fine on the page but making it cinematic is a challenge for which Sommers wasn't suited. It's clunky instead of dread-inducing. And Yelchin doesn't adequately sell the tension of the vision or the subsequent appearance of "Bodachs," creatures who Thomas sees when something horrible is going to happen. Yelchin is an interesting actor left hung out to dry by a writer/director who can't build tension and doesn't have time for character. Odd knows something bad is going to happen. We know Odd is going to stop it. There's no movie otherwise. And so "Odd Thomas" becomes a film that's going through the motions with too little character, style, or atmosphere to keep it engaging. Sommers and his team rely on the narrative in Koontz's book but fail to realize that it's the character of Odd Thomas—the wisecracking medium who happens to be a fry cook—that made the novel a hit. By surrounding Odd with cheap special effects, wooden supporting performances, and overused camera tricks, they've given this once-promising character a fate similar to death—a pretty bad movie.